Our A2 Tool Steel Blades are cryogenically treated, hardened to Rockwell 60-62 and double tempered. We use a heat treating technique that ensures the blade will take and hold a very fine edge for a long time. After heat treating, the blade is fully surface ground on the top, back, and cutting edge, giving a smooth, flat surface that will take a mirror finish very quickly. Our blades are thick to provide solid, chatter-free cutting. 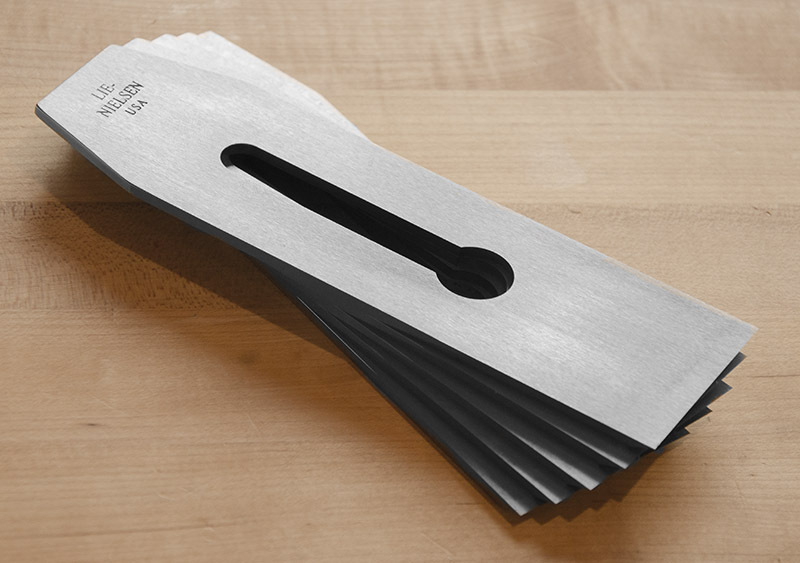 They come ready to use, but honing a secondary bevel of 5° to 10° will increase performance, help achieve a razor edge quickly, and improve edge life in hardwoods. You can find sharpening instructions in a printable PDF format here: Sharpening Instructions PDF. No. 2 Bench Plane Blade, 1-5/8"
No. 3 Bench Plane Blade, 1-3/4"